Naked walkers have been spotted in the Dales. Police are investigating after reports of naked hikers in the Yorkshire Dales. The walkers with a penchant for developing an all-over tan have taken to striding out across the countryside clad in only stout footwear. The activity, known as "boots-only hiking", is becoming increasingly popular in the more remote parts of the Lake District and the south of England. But now reports are reaching North Yorkshire Police of sightings of walkers out in the soaring temperatures with nothing to cover their modesty. 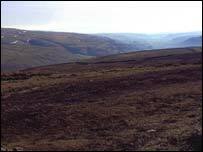 A police spokesman said they were investigating the sightings of two naked ramblers on the Pennine Way last week. Not only do the walkers have to contend with brambles and barbed wire, but the county's police forces sometimes use the land to exercise their dogs. The spokesman said: "It's not that often that we run the dogs up there, but it does happen." And as the temperatures continue to rise, the force spokesman agreed that inquiries at local hospitals into sunburn in unusual areas of the body could be an option. He light heartedly said: "We do have a duty of care, perhaps we could go to hospitals to see if anyone has suffered sensitive burns. "We do take the sightings seriously as they have caused distress." Cassandra Tebb, of the Yorkshire Dales National Park, said: "We do have guidelines for walking in the countryside such as suitable footwear and sunscreen in hot weather. "However, we do recommend clothing be worn as there are some nasty brambles and nettles, but having said that, rights of way are managed for everyone to enjoy."